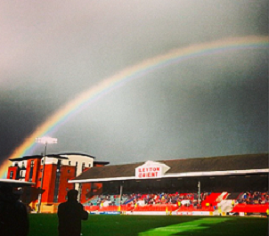 A game which… began with a rainbow, a tornado and the ongoing hope that Orient will soon be transported to the magical land of the Championship. 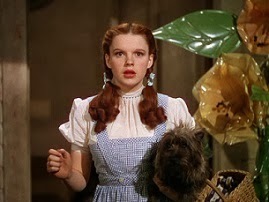 Yes, that’s right, this report is going to be peppered with laboured references to the Wizard of Oz, and until the 88th minute it did look like there was no place like home. Up until that point, though Orient were far from their fluid best, they appeared to be on course to grind out a 1-0 win through sheer bloody-mindedness. That they were undone by a late double-sucker punch hurts for sure, but it wasn’t down to any lack of heart, courage or intelligence (WIZARD OF OZ REFERENCE. Keep up!) on the part of this marvellous Orient team. It’s football, these things happen once in a lullaby. We’re way up high in the table. We’ve only lost five games. Keep wishing upon a star. Moment of magic… Just the one, really, the moment David Mooney rose majestically above the Peterborough defence like a coked-up Dublin teenager trying to scale the walls of the local Guinness factory and headed Orient in front. Moment of madness… The moment in the first half when Dean Cox finally tried to pick on someone his own size - Peterborough’s 4ft 7in midfielder Danny Swanson. 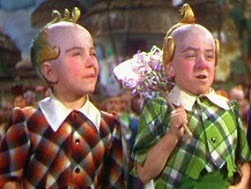 The subsequent altercation had all the aggression of two munchkins throwing cotton wool at each other. Top gun… Mooney played sort of ok given he’d been out for a while; the defence were resolute and solid for 88 minutes; and some bloke who’d rocked up from Hackney Marshes to play in goal had a pretty good game until the Peterborough winner, which he probably should have saved. Hard to pick a man of the match. Probably Omozusi until he went off injured. Little donkey… Were Romain Vincelot playing for Peterborough, he would have been their man of the match, given that he was the one who was stringing most of their passes together and was behind all their best attacking moves. Now, I’m not questioning Vincelot’s ongoing value to the team - he’s been massive this season - but what fresh level of hell did this performance spring from? Did the Wicked Witch of the West steal the Frenchman’s ability to control a football? It was Vincelot’s mistake that led directly to Peterborough’s winner and he was wasteful throughout. He still probably got the star man award in the Supporters’ Club, mind. In the dug out… Our very own Wizard of Orient seemed to have got his wands crossed a bit today. Slade bemoaned the players’ failure to close out last week’s game against Rotherham, yet when 1-0 up today with minutes to go didn’t see the need to bring on Bartley or Ness to shore things up. Instead he swapped Mooney for Simpson, which made about as much sense as replacing Judy Garland with a bag of rotting crab apples for the final scenes of the great 1939 film. View from the opposition… Given Peterborough’s rich and impressive footballing heritage (a total of five seasons in the second tier plus one FA Cup quarter-final in 1965), it’s understandable why many of their fans seem to feel that League One is beneath them. Here’s the delightful Mark Carter, for example: "I wonder what Leyton fans thought of playing a decent team this week." But it’s ironic given that they’ve spent most of the season patronising “little” Orient that they are celebrating their late and lucky victory (helped by a goal from their million-pound striker) like they’ve just won the Champions League, the Euromillions Lottery, the National Disco Dancing Championships and the Ladies Downhill Alpine Skiing at the Winter Olympics all on the same day. Tweet of the week… Let’s take our minds off this painful defeat for a moment and instead turn our attentions to Joe Dolan - once a cowardly lion at Millwall before joining Orient and showing all the mobility of a tin man. The ex-defender is finding life the fast-lane of an ex-footballer a little bit troubling, as this tweet demonstrates: "Left my wash bag at the gym last week, no one handed it in." Next week Joe is livid when his local Tesco runs out of dishwasher tablets. Great stuff.....good to have you back Matt. Occasion has become a common replica watches impression civilization commenced. Sailors ended up with all the sun's rays along with celestial body overhead to see your verse of your energy. In territory your sundial ended up being a method involving retaining region. It turned out a new ancient ways to paying attention to rolex replica nevertheless during those times the idea labored. In the past designer watches built your cross over via bank account for you to wrist. Bank account designer watches ended up awkward to handle nevertheless hundreds of rice that's the selection involving adult men. Your bank account enjoy ended up being sizzling hot pertaining to adult men to hold course for you to replica watches uk of their day-to-day business ventures. Your enjoy grew to be a symbol involving riches also. Better off of you are your fancier your enjoy plus the enjoy fob. That they is often a exclusive chemical substance that comes about effortlessly that is known. It can be mined as being a material ore, and possesses your atomic variety hublot replica. That they features a lot of attributes which have been desired in a very material, including energy, weight to everyone varieties of deterioration ., and is also light and portable. This specific creates omega replica the perfect material pertaining to building many pieces pertaining to several distinct specialties. While using joy over the attention grabbing see and the novel style, a number of was probably sidetracked right from check out. Lets hope this focused record produces these folks returning to all the fore in the neighborhood. Included in the enjoy is a brand-new exercise which usually generates when this in-house created completely new devices. The brand new routine is normally fittingly called the ultra-modern style. It is a computerized along with a line wheel-based chronograph in addition to 72 working hours in electrical power arrange. One more time all the movements is very how it looks attractive when considering layout along with design. You will discover that activity in the sapphire exhibition caseback windows. What great time of year, when quite a few brand names place to gradually demonstrate to what they are perfecting meant for chosen lifestyle www.attrinity.com. This also will allow nearly the tip of your day time hands to always be disguised within the primary call, an ingenious strategy for handling a number of the litter achievable using an gross work schedule screen.